On Aug. 30, 2017, as the morning sun rose over the dusty savanna of West Africa, few were aware that the rustling breeze announced the birth of a terrifying but still unknown event. Who amongst us would recognize the gentle stirring of a giant yet to be? It is here, over these rolling yellow grasslands, where the beginnings of some hurricanes come to life. Hot, dry air from the Sahara Desert collides with cool, wet air from the Gulf of Guinea, tucked under the big northwest bulge of the African continent. 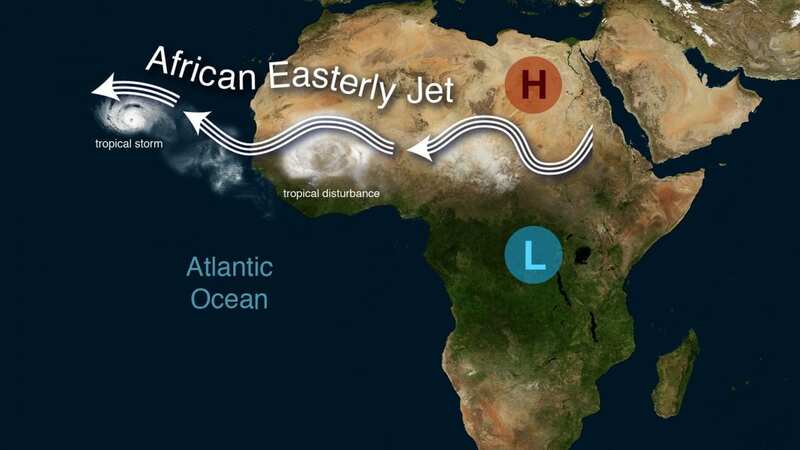 In the seam between these high- and low-pressure air systems, winds arise and blow westward toward the Atlantic in a powerful stream known as the African Easterly Jet. This jet is highly unstable. It undulates north and south and north again. Bands of thunderstorms break off from the swerving jet and follow our jet into the Atlantic Ocean. There, a combination of moist air, warm ocean temperatures, and Earth’s rotation converge to provide all the ingredients to fuel a hurricane. All you need is some initial atmospheric disturbance—a band of thunderstorms perhaps—to trigger it. That’s what happened on Aug. 30 to give rise to tropical storm Irma. The whole world knows what happened next. 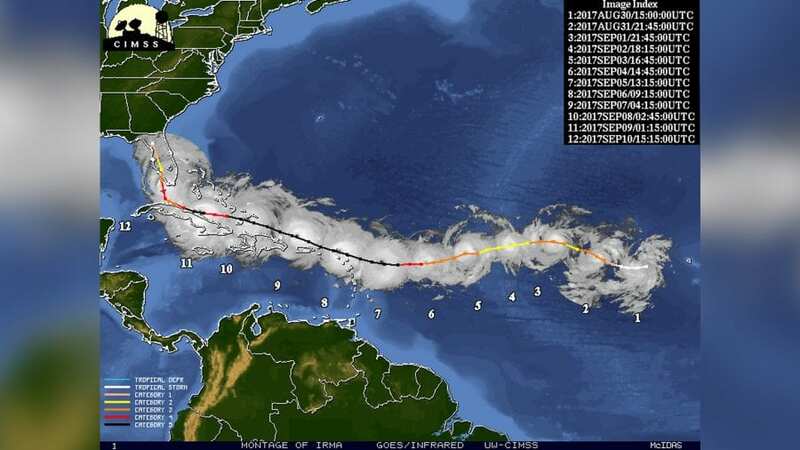 Irma moved westward, gathered energy from the warm moist air over the ocean, and intensified to Category 5 strength with wind speeds greater than 175 miles per hour. Irma left a trail of destruction in her wake, devastating Barbuda, the Virgin Islands, the Bahamas, and the Florida Keys. But that’s not all it left behind. As hurricanes such as Irma approach islands in the Caribbean, their strong winds generate huge waves that pick up large coarse-grained sand particles from the ocean floor and fling them into coastal lakes or lagoons. As the storms pass, the suspended particles drift back to the seafloor of these sheltered coastal basins and stay there, preserved in these tranquil environments for thousands of years. That’s where I come in. I’m a graduate student pursuing my Ph.D. degree in the MIT-WHOI Joint Program in Oceanography. I work in the Coastal Systems Group at Woods Hole Oceanographic Institution, where we uncover the locations of these coastal basins and bring back some precious sediments that contain clues of past hurricanes. We follow the sedimentary evidence left behind from storms such as Irma to reconstruct the history of when and where hurricanes have struck over recent millennia. In pursuit of this goal, I found myself coated in sunscreen aboard a small pontoon boat crammed with equipment and other scientists headed toward the coast of Long Island in the Bahamas in 2016. This is the same Long Island that, one year later, would be ravaged by Hurricane Irma. We may have seemed a comical lot. Strapped to our pontoon boat were thirty-foot-long aluminum tubes extending far beyond the bow of the boat, giving us the appearance of a vessel in search of a jousting opponent. We used these tubes to extract sediment cores from the seafloor. We lowered the tubes to the ocean bottom, vibrated them into the sediment with the help of a powerful motor, and brought up tubes of intact sediment that ranged between thirty and sixty feet long. A longer tube reaches deeper into the sediment. The farther it goes down, the further back in time we can reach. So we always think big, bringing the longest tubes we can purchase and transport. Lowering a tube to the seafloor often takes more than an hour of straining under the sweltering hot sun of the Caribbean, and bringing up an intact tube isn’t always guaranteed. If we drive the barrel too far into the sediments and strike the bedrock underneath, the pressure on the pullout can be too great for our small vessel or for the aluminum tube. Many times the pressure on pullout shears the tube in half, and we bring up an empty tube. And, of course, there is always the constant fear that the pullout might sink our boat. 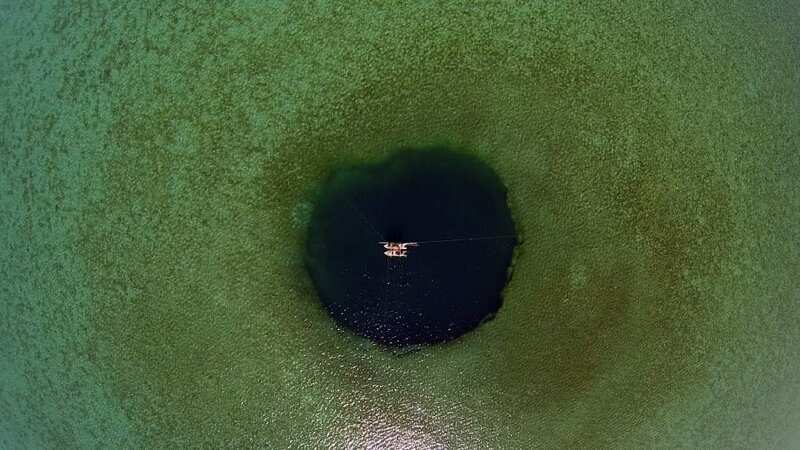 We were searching for a “blue hole”—a big round patch of deep blue water surrounded by a contrasting expanse of sunlit turquoise water common on the shallow banks of the Bahamas. The blue hole gets its color and its name from the extraordinarily deep hole in the seafloor beneath it. 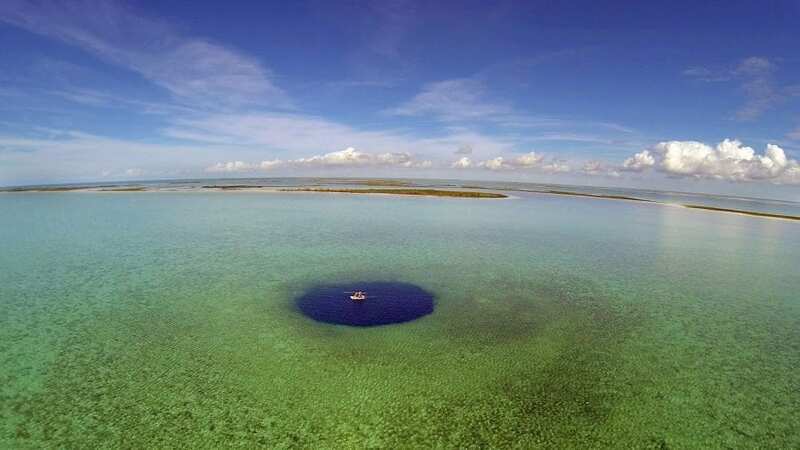 Blue holes were once underground limestone caves that formed above water when sea levels dropped during the last ice age. Over time, these caverns collapsed, carving out deep holes in the ground. 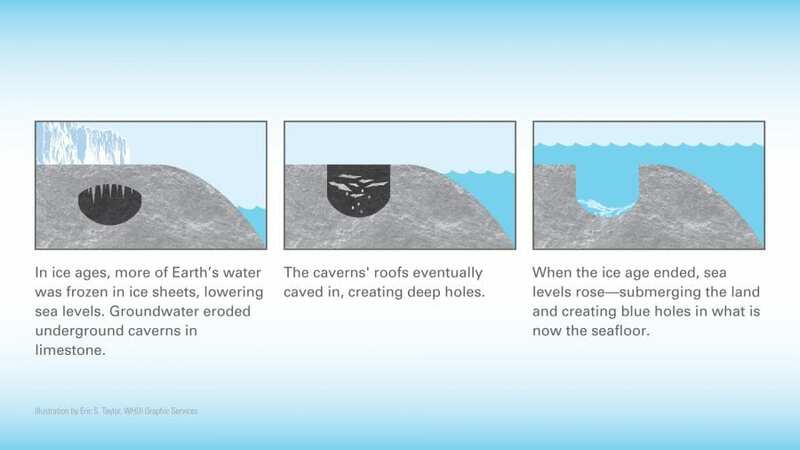 When the ice sheets thawed and sea levels rose, the caves were submerged, creating ideal basins for capturing coarse-grained particles swept in by overlying storm waves. They also provide a sheltered environment to preserve the particles as sand layers on their bottoms. We steered our pontoon boat over the center of a blue hole, and our team burst into action. “Teamwork makes the dream work!” repeated Pete van Hengstum, one of our collaborators, from Texas A&M University of Galveston. It takes a small platoon of scientists and students to make coring blue holes successful. 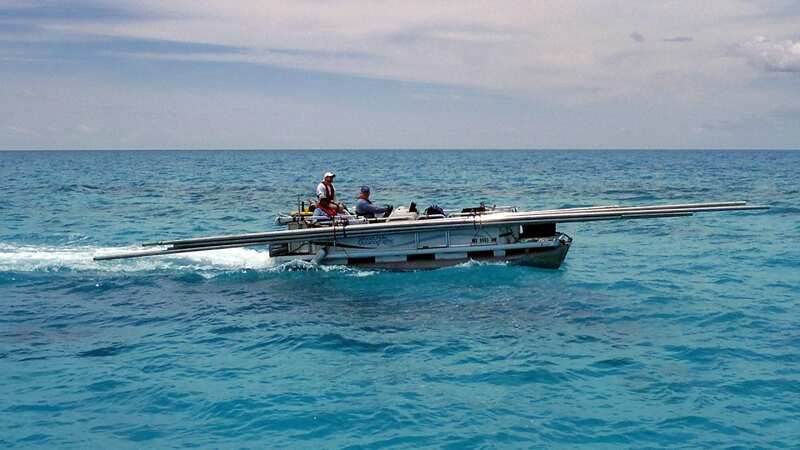 In this case, one team stayed aboard the pontoon boat to set up the coring equipment and begin the process of pulling up aluminum tubes full of sweet, sweet mud. I joined the second team ferrying cores ashore where we began processing them. The not-so-simple act of bringing up cores from the bottom of the blue hole is only the beginning of the battle. A thirty-foot-long barrel full of mud can weigh more than 300 pounds, making it impossible for a single person or a small team of people to move it great distances. My team needs to cut it down to a more manageable size. Once we dragged a core on shore, we set upon it with hacksaws to cut it into smaller sections and with caps and electrical tape ready to seal the tops. Sometimes air in the tubes caused sediment to explode out of the incisions we cut—and that, of course, spurred another frenzy as we all attempted to cap the core section before we lost any of our precious mud. At the end of the day, we had collected four or five cores from the site, cut and labeled them, and readied them for shipment back to the lab at Woods Hole Oceanographic Institution where I would analyze them. We hoped that they would tell us how often hurricane events such as Irma struck the Bahamas over the past two thousand years. I often remark that I have the best job in the world. Not many people can say they get paid to play with mud every day. Back in the lab, I spend my days perusing our library of sediments. Conventional libraries consist of shelves and shelves of books telling stories of the world. Our sediment library takes an unconventional approach to storytelling. It is filled with shelves and shelves of sediment cores extracted from icy Greenland to the jungles of Fiji. The cores in our library tell stories of the past—in particular what the climate was like long before these regions were settled by populations who recorded history. Our cores from Long Island in the Bahamas joined this collection, providing a glimpse of hurricane activity extending long before Europeans sailed across the Atlantic to colonize these island locations. When we split the sediment cores from Long Island in half, they displayed a distinct orderly beauty. Layers upon layers of golden carbonate sediment lay perfectly compacted on top of one another. To uncover what each layer tells us, I removed centimeter-wide chunks of sediment from the core and ran these samples through a fine-meshed sieve. The finer-grained particles pass through, leaving the coarser sand particles. I hunted down the sandiest layers in my sediment cores, the layers that represent hurricanes passing Long Island. But how can we tell when these hurricanes passed by? To put an age on every sediment layer, I pulled small specks of mangrove leaves out of sections of the cores. These leaves—also blown into the blue hole by hurricanes—contain radiocarbon, a naturally occurring radioactive isotope of carbon (14C) that resides in every living thing on Earth. When a mangrove leaf dies and falls into a blue hole, its radiocarbon begins to decay at a measurable rate until it becomes the stable carbon isotope (12C). I am lucky to have, within walking distance of my lab, the National Ocean Sciences Accelerator Mass Spectrometry Facility (NOSAMS) at WHOI, where colleagues can measure the ratio of 14C to 12C isotopes in my samples and determine how long ago my mangrove leaves drifted into the blue holes. Together, the combination of grain size data and radiocarbon dates from mangrove leaves revealed a record of dramatic changes in hurricane strikes over Long Island over the past seven centuries. From the 1400s to 1600s, hurricanes struck Long Island time after time, knocking layer after layer of sand into the blue hole. The same high level of activity is true for the present. Over the past two hundred years, Long Island has been battered by an average of six storms per century. 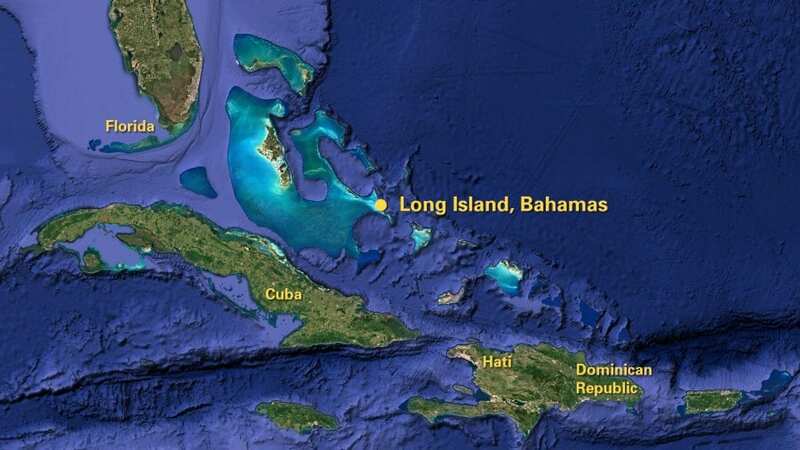 During the 17th century, however, hurricane activity on Long Island virtually shut down. Only one or two storms hit the island. What could have caused this hiatus in hurricane activity that lasted almost a century? We are still trying to puzzle that out. Is there some perfect combination of ocean or land temperatures, wind patterns over the West African savanna, or additional conditions that spin up large numbers of hurricanes in the Atlantic? Will Earth’s changing climate shift the formula? Only more work and more records will tell. 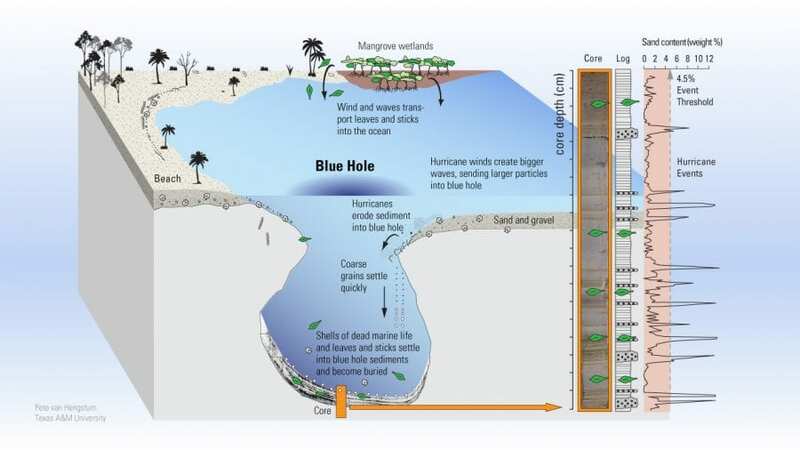 Years from now, researchers may core a blue hole and find sand deposited by Irma in 2017. But that hurricane is already known. We are uncovering the long history of unknown hurricanes—paleohurricanes. That history will help us piece together the complex equation that spawns modern hurricanes and help us predict how often they will occur and how strong they may be in the future. Funding for this research came from the Dalio Explore Fund, the National Science Foundation, the National Science Foundation Graduate Research Fellowship Program, and Woods Hole Sea Grant. Will Oxygen in the Ocean Continue to Decline?